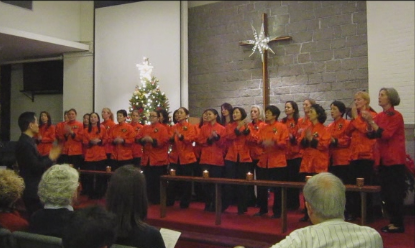 Titled “Swingin’ at Santa’s Place”, our Christmas concerts at the Methodist International Church and Rosary Church, together with Grace Notes’ a capella concert “Home on That Rock” at Club Lusitano, raised more than $55,000 for Silence, an organization with the mission of helping the hearing impaired. Grace Notes, our a capella group, singingUp on the Housetop. Nova, the accompanied choir, singingChristmas Glory Hallelujah, a spiritual song.